October was a record month with a 65.9% growth in total bank – a sweet £693 in profits. How did things go in November? As you can see, November was the most volatile month to date. After the first six completed betting days of the month, I was down £238 🙁 only to bank a whopping £1,090 in the six days that followed 🙂 All of that meant the profit at the halfway point of the month was a very healthy £852. I was feeling quite confident that November would see yet another record month, and trump October’s £692 gross profit…. However, the next two weeks were pretty miserable! The winners dried up, the places went a.w.o.l. and the losers kept on coming. From that mid-month high watermark, a total of £476 of built-up profit was eroded by month-end. This is clearly frustrating in a ‘what might have been kinda way’ but ultimately, the month was still profitable! Overall, the total bank increased 21.6% this month, bringing home £376 in profits. Since July, that’s a cumulative gross return of 318% taking a starting bank of £507 to £2,120. Can’t really complain can I! The most significant development during November was the increase in staking amount from £10 to £16 in order to correct the drift in risk budget and ensure it was back up to roughly 1% risk per trade. After that tough opening week, I did drop this down to £14 (i.e. £7 eachways). In total, 548 bets were completed across 26 days in what was easily my most active month yet. That’s an average of 21.1 bets per day, again driven by an increased focus on multiple bets (doubles, trebles etc), which totalled 87. In total, I turned over significantly more volume totalling £7,270 through my chosen bookmakers, yielding a 5.2% return on investment (ROI). November also brought new highs and lows in terms of individual days. The best daily profit was a stonker £342, helped by one horse called Samson’s Reach which managed to win outright despite being priced at odds of 41.0! netting my biggest individual win to date of £350! The worst down day was -£240. This meant that an average daily profit for November was a lower figure than recent months at £14.48. In terms of bank highs and lows, I obviously fell some way short of the high watermark of £2,596. That being said, I’m not complaining as it still meant capturing 82% of the maximum high. In contrast, the bank low was £1,506 – a £237 drawdown from our starting position of £1,744. Of course, there are the monthly OddsMonkey subscription fees to deduct, leaving an overall net profit of £358 (+20.5%) for November…. still very respectable! So with November officially a wrap, let’s quickly recap what this all means for the results since inception with five completed months under our belts…. 1,651 total bets completed across 108 days. That’s an average of around 14.8 bets per day. The best daily profit overall is £342, and the worst down day was -£240 (both from November). Average daily profit remains at £14 overall. 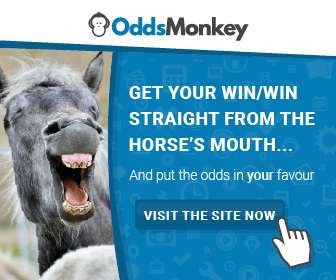 Net of all OddsMonkey subscription costs (5 months), overall profit is now £1,524 (or +300%). So, that’s me! How are you getting on with Each Way Betting? Did November prove a bumpy one for you too? I’d love to hear how you’re getting on. November was a roller coaster month but actually turned out marginally better for me than the nightmare that was October! I’m just glad that the trend is still going upwards but it’s tough swallowing the losses. My overall yield is just under 10% now, that’s after around 5100 bets (£23k staked). I shall of course continue with the strategy – good luck to all of us!